Rest stop on the first climb of Sonoma Mountain Road. March co-leader Bruce Hagen is at right. Independent filmmaker Jonathan Blease is in the middle of the road, seeking the best camera angle. 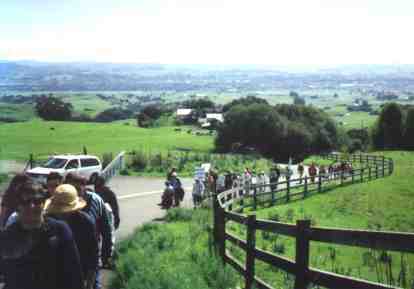 Marchers make the final climb to the Lafferty gate. 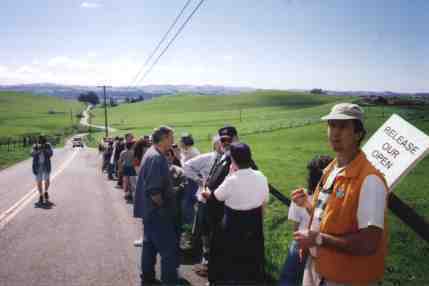 Note the view of the Petaluma Valley unfolding in the background. The elevation at this point is under 1000'. 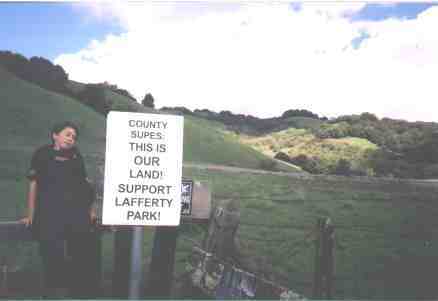 The top of the Lafferty Park property is over twice that elevation (about 2100'), with a proportionally even more spectacular view. A young marcher rests on the closed gate of Lafferty Park. Highlighted in the distance is a portion of the headwaters canyon of Adobe Creek, within the park boundaries.